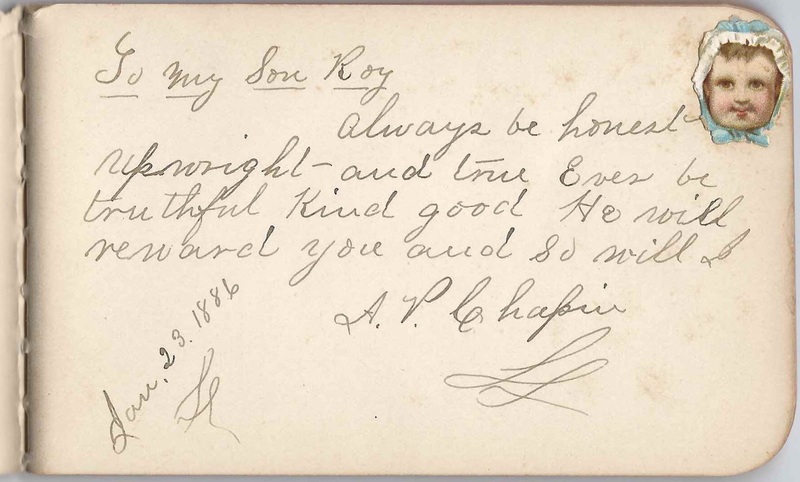 1886/1887 autograph album of Roy H. Chapin of Fenton, Michigan. Sadly, Roy would die in 1888. He's buried at the Oakwood Cemetery at Fenton, Michigan, where his parents and other relatives are buried. 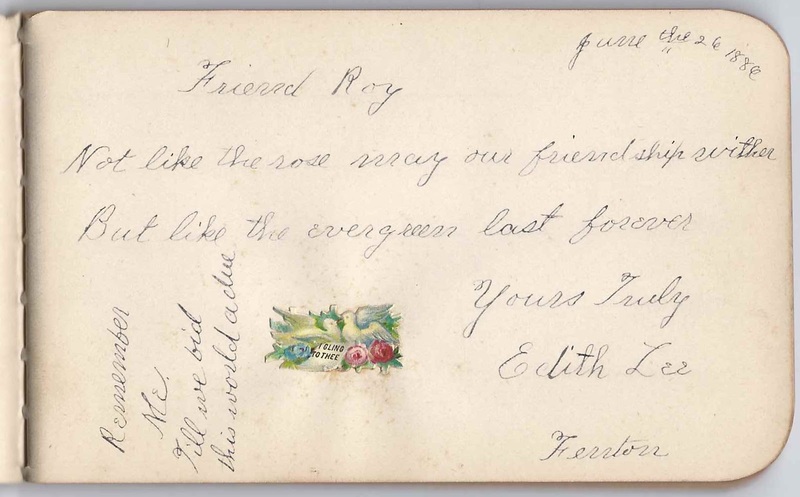 The album is approximately 5" x 3" and contains the sentiments of six of Roy's relatives and friends. 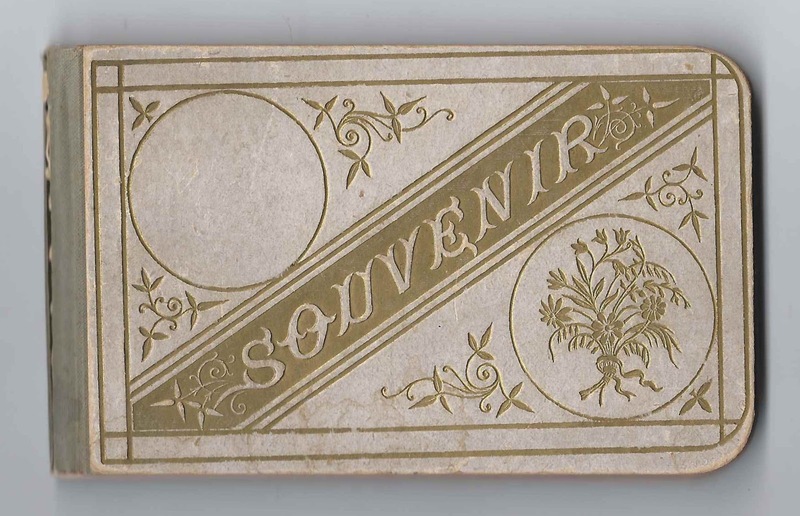 The front cover is detached, and there might be few missing pages in the front, including any title page, ownership page or presentation page that might have existed. An alphabetical list of the signers appears at the end of this post. 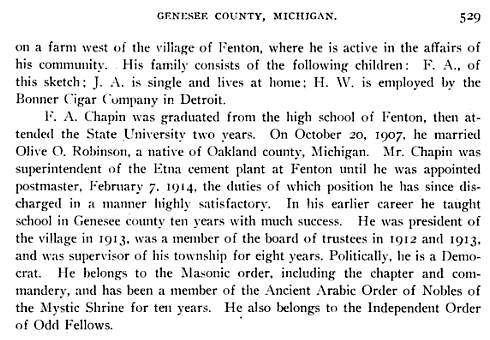 Roy H. Chapin was born about 1876 in Genesee County, Michigan, the son of Addison P. Chapin and Mina G. (Hamper) Chapin, who were born at Fenton, Michigan, and Ashford, in Kent, England, respectively. 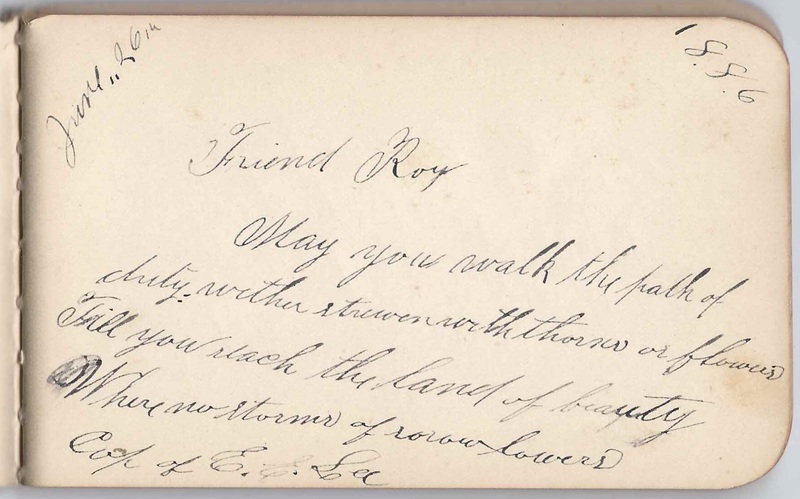 Roy's father signed a page in the album on January 23, 1886. Roy's mother Mina didn't sign a page in the album, unless she signed a page that is now missing. 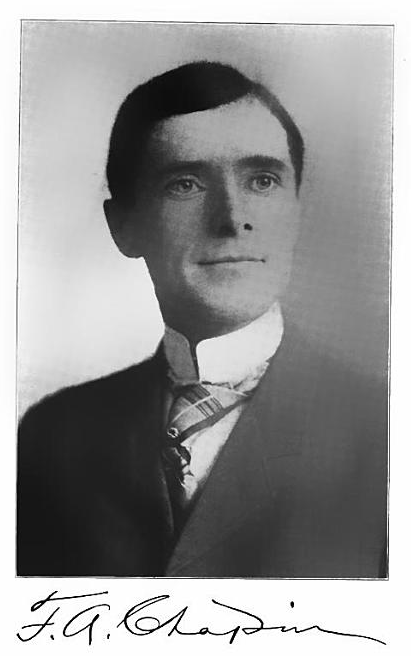 Representating Roy's maternal line, however, was signer Beatrice Hamper of Greenville, Michigan, who was the daughter of Mina's older brother Henry Hamper. 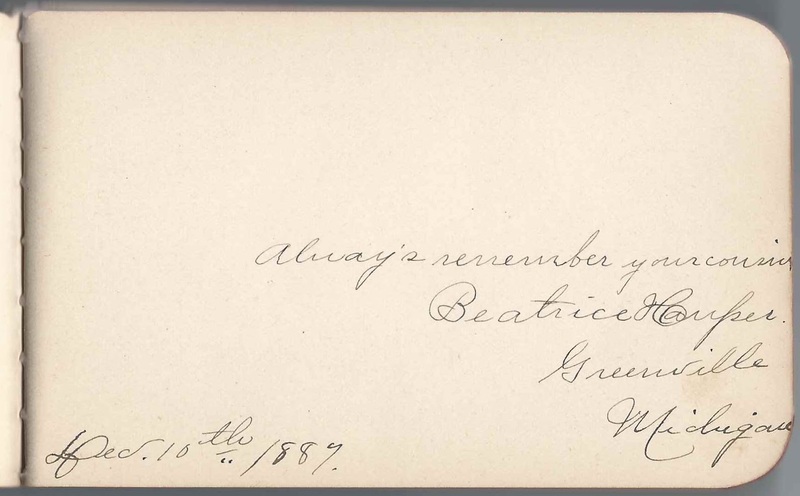 Beatrice signed her page on December 10, 1887. The four other signed pages in the album were signed by people with the surname Lee, two of whom didn't mention a residence and two who gave their residence as Fenton, Michigan. E. E. Lee signed a page on June 26, 1886. He may have been Elmer E. Lee. 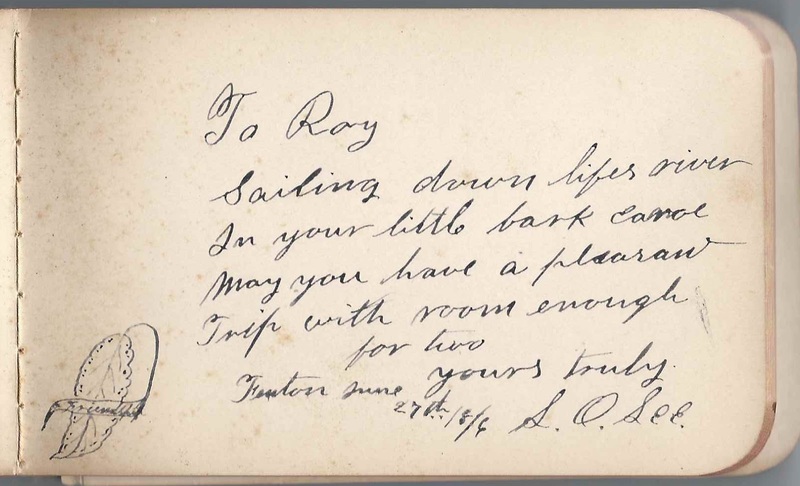 S. S. Lee signed a page. Edith Lee of Fenton, Michigan, signed a page on June 26, 1886. She may have been Harriet Edith Lee, brother of Elmer E. Lee, who may have been the E. E. Lee who signed a page above. 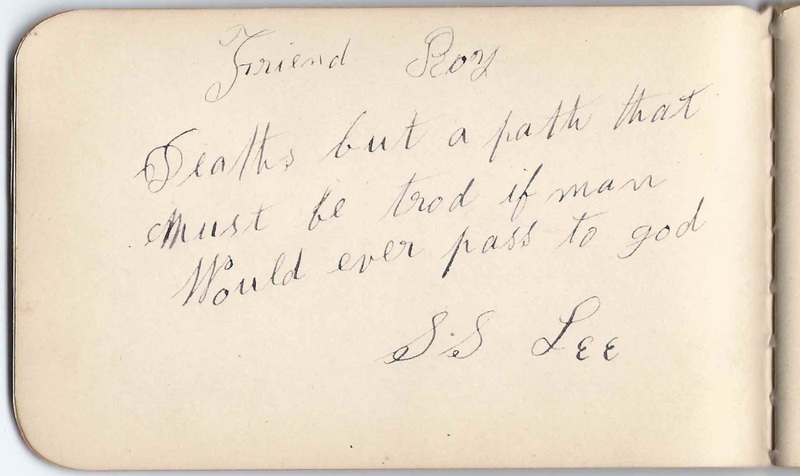 S. O. Lee of Fenton, Michigan, signed a page on June 27, 1886. The History of Genesee County, Michigan: Her People, Industries and Institutions, written by Edwin O. 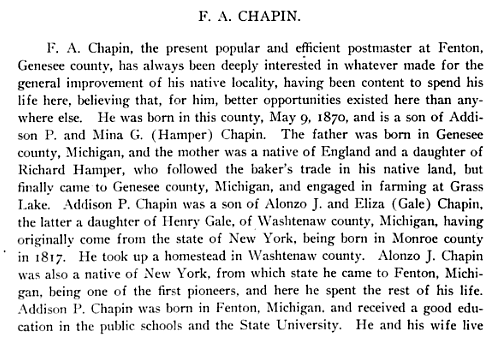 Wood, LL.D., and published in 1916, contains a brief biography of Roy H. Chapin's oldest brother, Floyd A. Chapin, who became postmaster of Fenton, Michigan. The biography has information on the brothers' parents and grandparents, but there's no mention, sadly, of Roy. If you have corrections and/or additions to the information above, or information to tease out the identities of the various members of the Lee family, please leave a comment or contact me directly. Thanks!